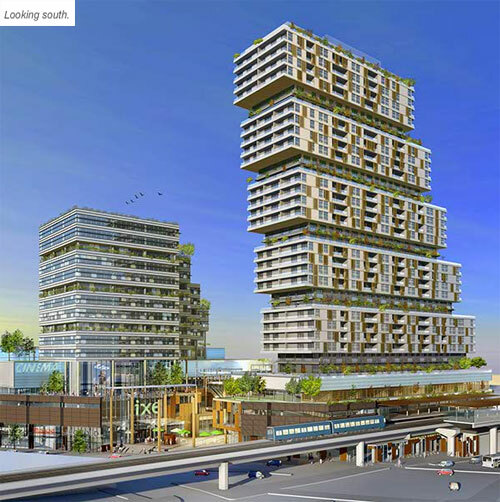 JULY 20th UPDATE > Vancouver City Council APPROVES the Marine Gateway Vancouver real estate development consisting of 3 mixed-use towers in the Marpole District by a vote of 10 to 1! The Marine Gateway Vancouver condo towers will be 208 feet, 255 feet and 335 feet on top of commercial/retail podiums and the entire project will include close to 900,000 square feet of space. 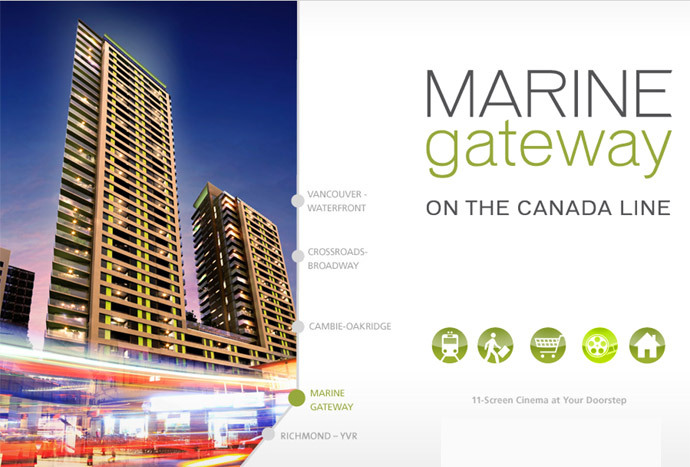 The Vancouver Marine Gateway real estate development is situated between Yukon St and SW Marine Drive on Cambie Street next to the Marine Drive SkyTrain station. The new Vancouver Marine Gateway condos will number 464 residential units in which forty six are for affordable Vancouver housing. The Marine Gateway project designer is Peter Busby at Perkins and Will. Located in the ever changing Marpole Vancouver real estate district, Marine Gateway will be more than just condo towers, but it will also feature 276,355 square feet of office space in the 208 foot Marine Gateway Tower 1, in addition to 331,775 sf of residential suites in Marine Gateway Towers 2 & 3 which are both on top of a podium that is for commercial and retail offices. The master planned Marpole Vancouver Marine Gateway community will be home to about two thousand new residents in addition to providing space for 1,500 office workers. The pre-sale Marine Gateway Vancouver condos are expected to average around the mid $300,000s with a starting price point in the mid to upper $200,000s. 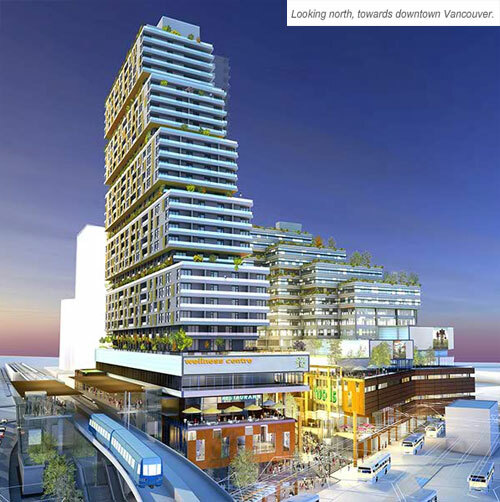 A proposed mixed-use Vancouver real estate development by the PCI Group Developers may become the tallest tower outside of downtown Vancouver very soon! Called the Marine Gateway Vancouver proposal, PCI Group Developers is trying to get rezoning and approval from the City of Vancouver for their huge master planned community that will consist of affordable condos, retail, and commercial space. This ambitious redevelopment proposal by PCI Group at Marine Gateway Vancouver will be at the south east corner of Marine Drive and Cambie Street. The Marine Gateway at Canada Line Vancouver real estate development proposal may add a condo tower high-rise of 350 feet (three hundred and fifty feet) or 30 storeys (thirty floors) which will become the tallest tower in the Lower Mainland not situated in the downtown core. Not only that, but the landmark Vancouver high-rise at Marine Gateway Canada Line site will also be home to 577 or more new residential market units. At 105 metres, the proposed Vancouver Marine Gateway condo tower will actually rival many of the tallest downtown Vancouver condominium high-rises in height and with the tiered architectural plans, will offer incredible views, amazing outdoor living spaces and a striking façade that will forever change this Canada Line site. The entire Marine Gateway Vancouver real estate development site will be about two hectares in size. It’s central location will be a great draw for business and homebuyers, as the proposed Vancouver Marine Gateway condo project will actually be on top of the Marine Drive Station on the Canada Line SkyTrain route. Just next door to the proposed Canada Line condo tower will also be a TransLink bus exchange loop, so that this transit oriented master planned community in the southeast corner of Cambie St and Marine Dr will be accessible and convenient for residents and workers alike. The proposal itself by the PCI Group Developers is congruent on the City of Vancouver passing the residential component of the Marine Gateway Vancouver condo tower. There is a lot at stake, as the industrial zone south of Marine Drive is home to many businesses, and with an accepted proposal of a huge residential tower in the midst of this type of zoning there is a fear that companies and businesses will move out because property prices and taxes may increase. With its prime location at the Canada Line SkyTrain station, and with the mixed use proposal containing both retail and office space at Marine Gateway Vancouver real estate development, PCI Group Developers believes that this site will become the transition zone between industrial/commercial lands and affordable residential housing. They believe that this is the key to the sustainable community proposed for the new Vancouver Marine Gateway project. Marine Gateway will be located at 8400 Cambie Street (southeast corner of Marine Drive and Cambie Street in central Vancouver real estate market. 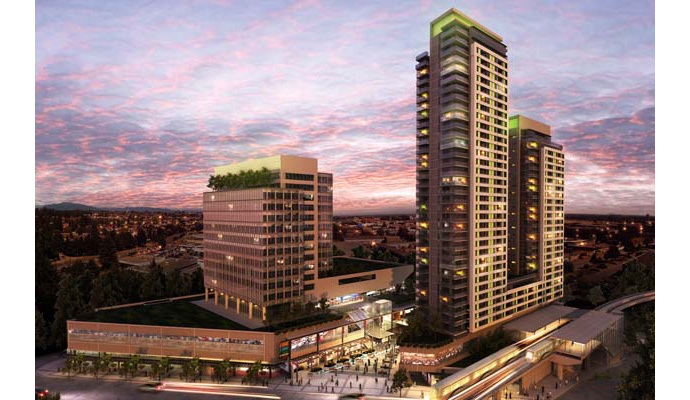 Mixed-use development featuring market condos, rental units, office space and retail shops. The Marine Gateway Vancouver project proposal is for the development of over 950,000s quare feet of space. Great location next to Canada Line Marine Drive SkyTrain Station plus TransLink bus exchange loop in addition to master planned sustainable community. Also, there will be a ‘High Street’ and gathering places at the Marine Gateway Vancouver proposed community which will be designed to exacting standards to achieve LEED Gold certification upon completion. As indicated in the section above, the Vancouver Marine Gateway real estate development will be a huge master planned community that will be self sufficient and sustainable. From LEED Gold standards to being situated in a walkable, green street neighbourhood, the Marine Gateway Vancouver condos will total more than 570 market unit and rental suites in the 350 foot landmark Vancouver high-rise tower. The residential condo tower at the Vancouver Marine Gateway high-rise will be home to approximately seven hundred and fifty to 850 residents. In addition, there will also be a magnificent 260 foot Marine Gateway office tower in this master planned community. This Marine Gateway Vancouver office tower will also house a 288,000 sq ft retail centre at the base that will support up to two thousand local jobs. It is hopeful that if the city approves the master planned development, that construction will start in 2011 with completion of everything by 2014. Although the PCI Group proposal is in its infancy, there are Marine Gateway public open houses coming soon through the summer and fall. With its current proposed architecture, the beautiful Vancouver Marine Gateway high-rise towers willb e designed by Busby Perkins + Will and David Dove. It is expected that the project will contribute more than $350M to the local economy. According to PCI Group, the proposed Vancouver Marine Gateway site is the largest undeveloped and pre-assembled Canada Line site, which can be developed right away. 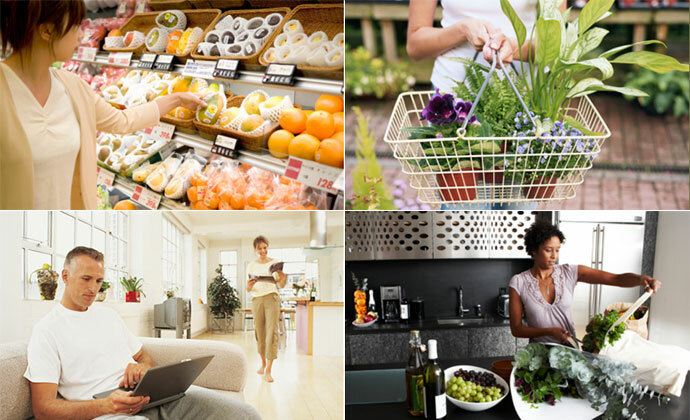 If you are interested in public involvement with this proposal, you can attend the community open houses, do the public opinion research or attend meetings with interested organizations. Some of Vancouver Marine Gateway’s sustainable strategies include the mixed-use ambient energy loop, geoexchange energy loop, building orientation, shading strategies, water conserving fixtures, green roofs, rainwater collection, solid waste reduction strategies and co-op cars. For more information about the proposed Vancouver Marine Gateway community, please visit www.marinegateway.ca for all the details. STAY TUNED as more information will be coming shortly on the Vancouver Marine Gateway proposal. Public Open Houses will be coming during the summer. NEWSFLASH – June 4, 2010 – The proposed Marine Gateway Vancouver real estate project at the south end of Cambie Street in Vancouver was rebuffed by the Vancouver Urban Design Panel by a vote of 5 to 4 as the project proposal split the panel. This massive housing, commercial and office development proposed by the PCI Group did not pass through the Vancouver Urban Design Panel as some thought that it was too much development and mass for this site and part of the city. To be one of the largest master planned developments ever and certainly the tallest residential/mixed-use tower project outside of the downtown Vancouver real estate district, the Marine Gateway proposal to some of the Urban Design Panel members was a huge addition to revitalize the area and create an ‘exclamation point at the end of the Canada Line’ Skytrain station. Althoug the Urban Design Panel does not decide whether or not the application/proposal is passed by Vancouver City Council, the volunteer panel does carry some weight in the final decision. Rejecting the Marine Gateway Vancouver project proposal by just 1 vote is not a huge disappointment, as the proposal is surely going to have to go through several design phases before it is passed. 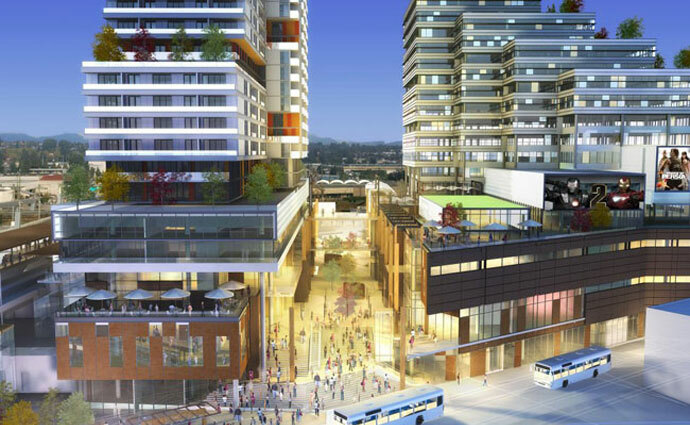 The contentious issue surrounding the negative press of the Vancouver Marine Gateway real estate development is just the shear size of the project that consists of two towers, a central courtyard pedestrian plaza and retail/commercial space. Usually, the developer will re-submit the project proposal to the Vancouver Urban Design Panel, and once it has the majority support, will submit the proposal to City Council for approval. On Tuesday, PCI Group is holding an open house on its proposed Marine Gateway Vancouver real estate development. 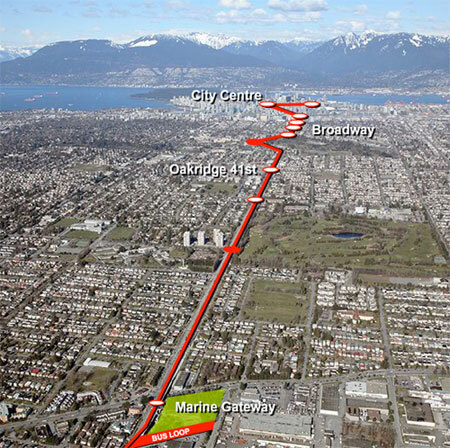 The Marine Gateway open house will run from 5-8pm at 8515 Cambie Street, Vancouver.